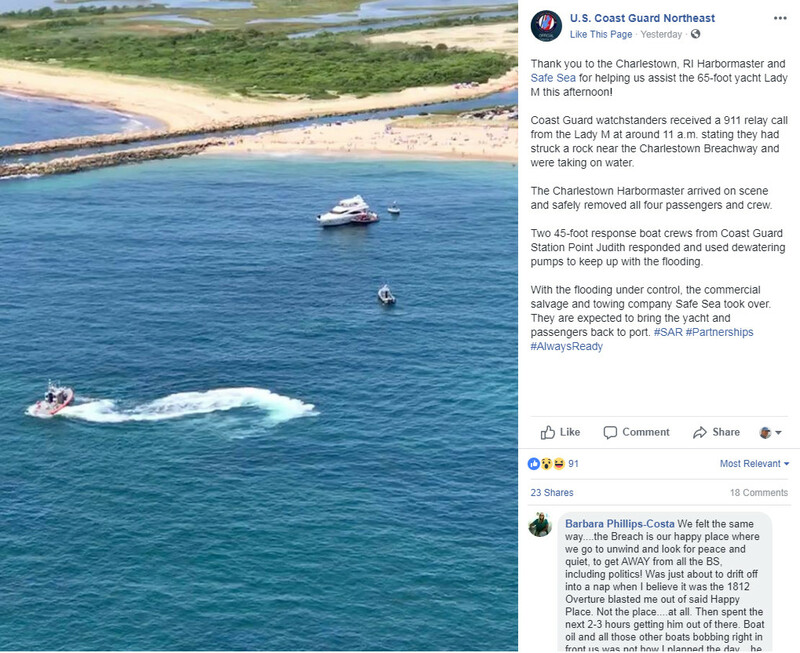 This U.S. Coast Guard Northeast Facebook entry seems to report the grounding incident clearly, and let’s note that they politely named the yacht, Lady M, but not the owner. Many of the commenters — some of whom were trying to enjoy Charlestown Breachway Beach during the hubbub — were not so kind. The Journal’s next paragraph dryly notes that “The Coast Guard on Monday morning said it has not determined what caused the boat to run into the rock.” And I thought: Time to check the charts! The Charlestown Breachway is quite distinctive and, along with the USCG helicopter photo, it was not hard to figure out about where Joe Trillo’s Lady M hit the rocks (though I welcome corrections). And he’s right (in a sense) that no specific rocks are charted (like they are further offshore on the other side of the Breachway). But, dang, if he wasn’t actually in the green area that drys out at low tide, he surely was inside the 6-foot contour, an area that this NOAA ENC vector chart defines as 0 to 5.9 feet deep. Moreover, this chart display is not just Overscale — as indicated by Coastal Explorer at the bottom of the screen — it’s WAY overscale. The NOAA RNC raster chart shows the overscaling better — one of the reasons I like them — because the titles and numbers don’t change size with the zoom level. This 1:4,000 scale view is essentially like holding a serious magnifying glass to a few square inches of a large 1:40,000 scale paper chart. Even if the NOAA cartographers actually had a lot of fine detail about that area, they did not have the resolution to show it. 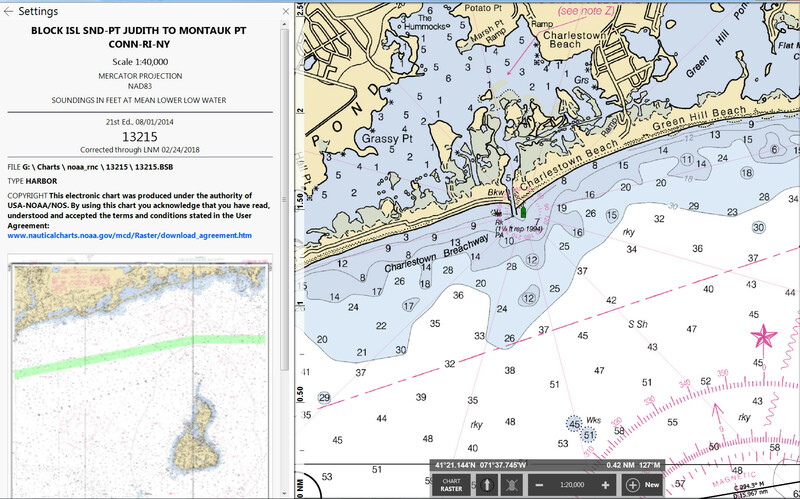 And, by the way, 1:40,000 is usually the highest resolution charting available along the U.S. Coast, with smaller area (larger scale) harbor charts reserved for especially complicated and well-trafficked spots. 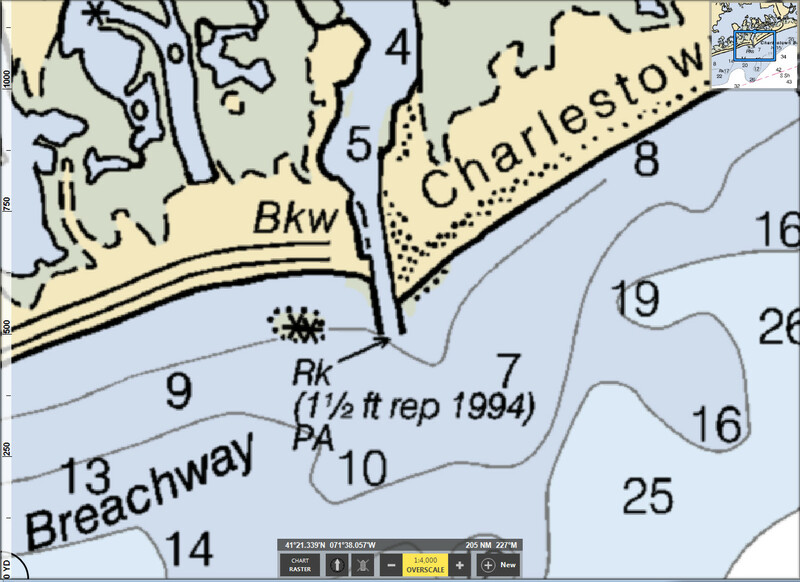 A lot of boaters need to better understand the relationship of detail and chart scales, but I’d like to point out to Joe Trillo that this chart actually does seem to show rocks — or at least some dots of concern on the wet side of the shoreline — about where he hit rocks. And the screen below shows the NOAA chart at a scale it’s meant to be looked at, and thus also how little space the cartographers had to indicate the detail Trillo seems to think he was entitled to. Title should be “Politician Hits Rock Bottom”..
Jim, I just spit out my coffee. Thanks for the laugh this morning. Certainly! Please be my guest! One time is for certain, if elected he’ll fit right in. Note the “reported rock” prominently charted at the mouth of the Breachway. I’ve gotten very skeptical about these. First, there’s the problem of what can NOAA do when someone makes a claim like this? 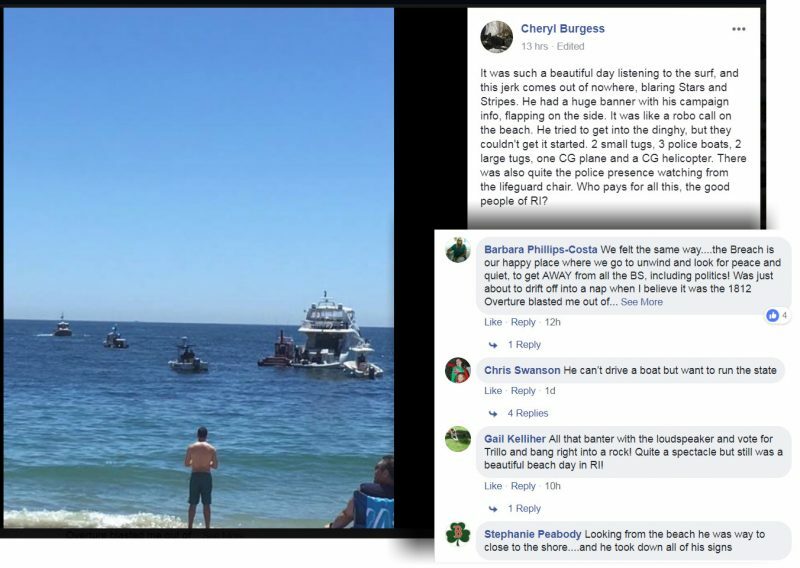 Sending out a survey team is a big deal, and no matter how many other boaters claim that such a reported danger doesn’t exist, who would dare remove it? I’ve also used my side and forward scanning sonar tools to look closely for reported dangers like this — in good conditions — and can’t remember finding a single one. And finally I’ve recently started looking around reported dangers to see what charted danger the reportee might have hit but couldn’t admit to. In many cases there’s a “Bingo!” possibility. 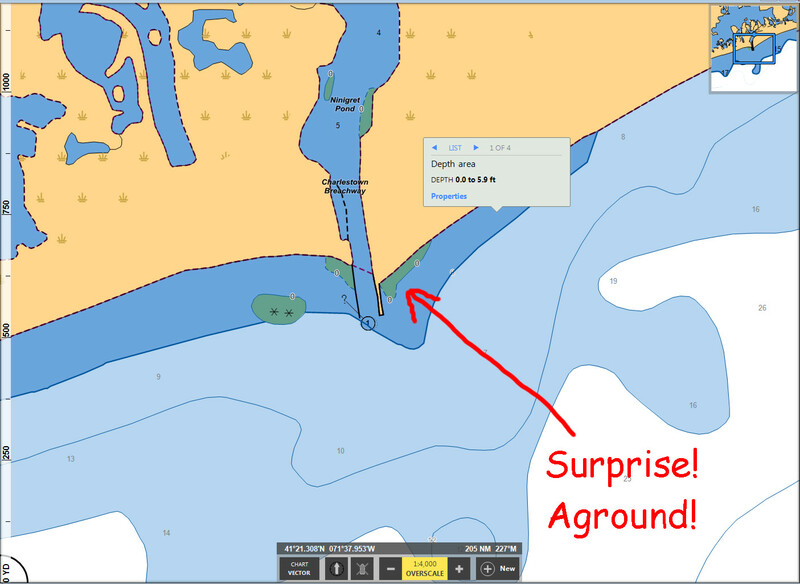 For instance, could the 1.5-foot shallow spot right at the entrance to the Breachway jettied channel actually be the tip of a jetty, and has yet been making conscious boaters nervous since about 1995? Has any reader been there? Joseph Trillo is not helping with my skepticism. I have never gone thru the breach way but I’m familiar with it. We sail by there quite a bit but much further off. I have also been to that beach quite a bit, Most boats stay about half a mile offshore. I had a friend who kept a small Grady White walkaround (maybe 21′) in the pond there. As I recall he told me you have to head almost straight in as there are rocks and shifting sands on either side. From watching boats run it that seems about right, most wait for high tide and head straight in. More details in the newspaper today with eyewitness accounts contradicting the story from Mr. Trillo. Sounds like the boat was very close to shore. Wonder if navigation system has the GPS track saved. Or a cellphone would also have a history of location where boat stopped. So maybe Mr. Trillo can offer his own data to help update the charts with the exact location. More to this story. 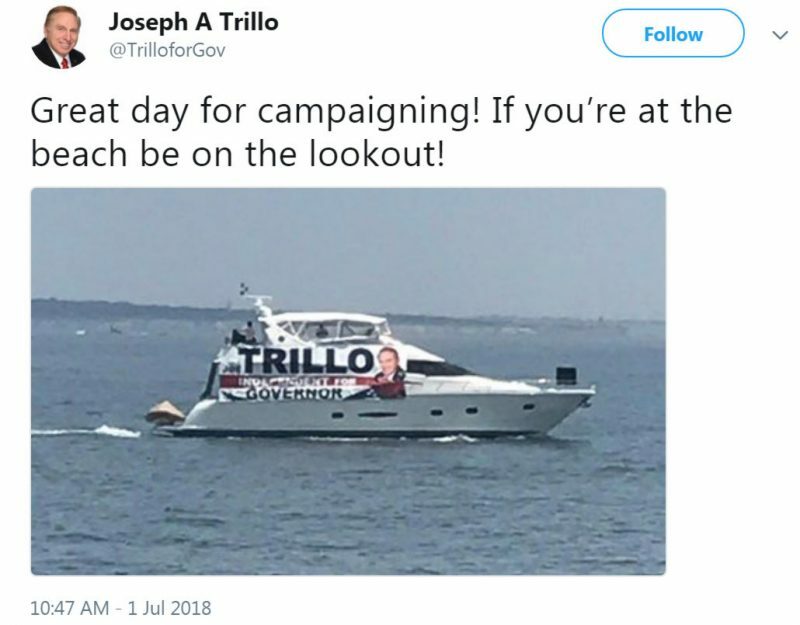 One might expect a politician to advocate positive measures for his fellow boaters, but in 2015 Mr. Trillo tried to legislate substantial state mooring fees on top of the local fees, with no ostensible purpose.